Extensive range of CAD interfaces and powerful modelling. VISI can work directly with Parasolid, IGES, CATIA, Creo, UG-NX, STEP, Solid Works, Solid Edge, Inventor, ACIS, DXF, DWG, JT Open, STL and VDA files. The extensive range of translators ensures that users can work with data from almost any supplier. Companies working with complex designs will benefit from the simplicity with which their customer’s CAD data can be manipulated. VISI can work directly with wireframe, solid, surface and mesh data or a combination of all four, providing the user with tools to work with any CAD data or to quickly re-model parts ready for machining, fully utilizing the power of true hybrid surface and solid modelling. Multiple roughing toolpaths. A combination of constant Z roughing, adaptive roughing, core roughing and rest roughing, combined with intelligent ramp, helical and planar entry methods provide the operator with the freedom to produce efficient NC code to suit any component. Combined with smooth corner radii and smooth transitions between passes, the tool will maintain the maximum feedrate on the machine tool, and prevent the cutter from dwelling in corners. For subsequent roughing operations, VISI will remember where remaining stock is left on the component and only machine in those areas. Wasted air cutting will be minimised and unnecessary rapid movements will be eliminated, while the cutter will avoid digging into areas where there is excess material, which could result in tool breakage. Where the starting billet is pre-machined, or possibly a casting, VISI will recognize and machine only where material exists, again eliminating wasted movement, and keep cycle times to a minimum. Adaptive clearance. 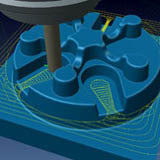 Adaptive clearance toolpaths allow the tool to rough the part in a unique way by roughing out from bottom to top. The principle behind this method is to machine large steps utilizing the full flute length of the tool with a small stepover and then machine the intermediate levels back up the part. Continually repeating the process until the entire component is fully machined. The tool remains on the part as much as possible and the toolpath automatically switches to a trochoidal type motion when the shape of the part requires. This toolpath ensures that there are never any full width cuts and guarantees a constant tool load. 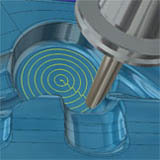 Tool wear is spread evenly across the cutting surfaces and the center of force is half-way up the tool, reducing deflection and the potential for vibration Using adaptive roughing, the cycle automatically adjusts the toolpath for efficient and safe machining, improving cutting conditions and allowing higher machining speeds to be maintained. The result is savings of up to 40% in actual cutting time. 3D step over finishing. 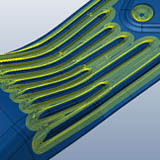 The 3D stepover toolpath provides a constant surface finish irrespective of the component shape. By morphing the toolpath across the surface of the component, one toolpath will finish the entire job, keeping the tool on the surface, minimizing retract movements and eliminating duplicate cutter paths. As the toolpath step over is smoothly adapted to the shape of the part, shock loading of the tool will be minimised, enabling the machine tool to run at the optimum feedrate. Rest machining of fine details. Small features on a model will usually require rest machining with a smaller tool to completely finish the detail. The rest machining command will reliably detect areas left by previous tools, so that they can be re-machined. For very fine details, this process can be repeated as many times as required to make it possible to successfully machine with very small cutters. The toolpath can work from the outside to the center or from the center to the outside of small blends. 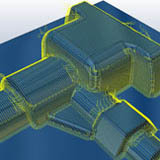 For features, which are very close together, the toolpath will morph and blend together around obstacles to provide a smooth and flowing toolpath without any sudden direction changes minimizing the number of retract movements and helping to eliminate shock loading on the tool and keep feedrates as high as possible. Short calculation times and batch processing. 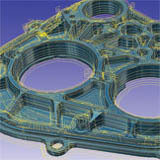 New algorithms provide very fast calculation times even for the most complex parts. High speed machine tools require huge amounts of data to keep them running efficiently. By keeping the calculation times as short as possible, unscheduled machine stoppages will be kept to a minimum. To maximize the deployment of the software, VISI uses multi threading technology to allow multiple operations to be calculated at the same time and batch processing to allow jobs to be queued for unattended calculation, out of normal working hours. To further speed up the preparation of programs, individual operations can be postprocessed separately, so that machining can start on roughing operations while finishing operations are still being calculated. Graphical toolpath editing and reordering. Once the toolpath has been calculated, it is possible to easily trim sections of toolpath and edit the rapid movements to optimize the cutting method to suit individual components. The sequence of operations can also be easily changed; a simple drag & drop concept can be used to modify the operation order. Toolpath editing provides the operator with the freedom to quickly arrive at their preferred machining method and sequence of operations. NC Feed optimization. NC code can have federate optimization applied to slow the feedrate when entering areas where larger amounts of stock occur, this all allows the machine tool to run faster and smoother. This option is constantly comparing the amount of material removed against the actual mechanical forces applied to the tool. The result of this sophisticated volume comparison tool provides a better toolpath, extending the cutting life of the tool while using the machine safely at the upper end of its performance regime. Kinematic simulation. Toolpath verification can be applied using the real machine dimensions and limits with the kinematic simulation. Cutting tool, holders, jigs and fixtures can all be checked when running the kinematic display. Any gouges on the toolpath against stock, tool or any other part of the machine tool will be graphically highlighted. A comprehensive list of tested 3, 4 and 5 axis machine are available. Hexagon engineers are also available to help with the construction of any bespoke machine.